Reprinted from the Transactions of the Institution of Engineers and Shipbuilders in Scotland (incorporated). Glasgow: Fraser, Asher & Co. Ltd., Printers and Publishers, 164 Howard Street. 1909. 20pp., 12mo. Stapled in grey printed wraps. In fair condition, lightly aged, in worn wraps. The paper was 'Read 4th August, 1909.' Containing five tables. [ Dr Richard Williamson, Headmaster of Westminster School. ] Autograph Letter Signed ('Rd Williamson') regarding the King's visit to a play. Deans Yd. [ Westminster Abbey ]. 12 December 1834. [ W. S. Percy, Australian comedian and travel writer. ] Autograph Letter Signed ('W. 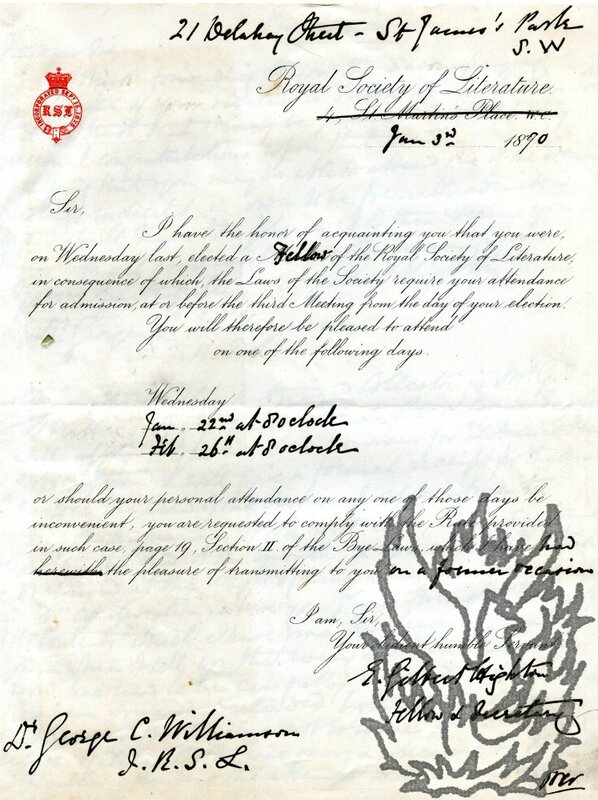 S. Percy'), a letter of condolence to the widow of Herman Finck..
On letterhead of 25 Cholmley Gardens, London. 21 April 1939. 1p., 12mo. In fair condition, lightly aged and worn. He expresses the 'deepest regret' at his 'dear friend's death [...] His passing will mean a great loss both to his friends & the world of music.' The word 'Answered' is written at the head. Percy made his in Australia in the productions of J. C. Williamson. He toured America before settling in England. Finck's 'In the Shadows' was one of the last pieces played by the orchestra on the Titanic. Subscription copy of the splendid coloured frontispiece engraving of a tiger, after a drawing by Howitt, to the original atlas folio edition of Williamson's 'Wild Sports of the East'. [1807.] 'Pub by Edwd. Orme | 59 Bond Street'. On thick light-blue/grey laid paper, 60 x 48 cm, with thin strip of white stub to left-hand margin. In a small neat contemporary hand in top right-hand corner: 'P. W. Baker Esqr. Subn Copy'. Lightly creased and worn, with a central vertical fold line running through the centre of the print, which is coloured in gouache in greys, greens, browns and pinks, with a blue bankground. A few small patches of colour rubbed away from the print, the dimensions of which are roughly 29 x 39 cm. 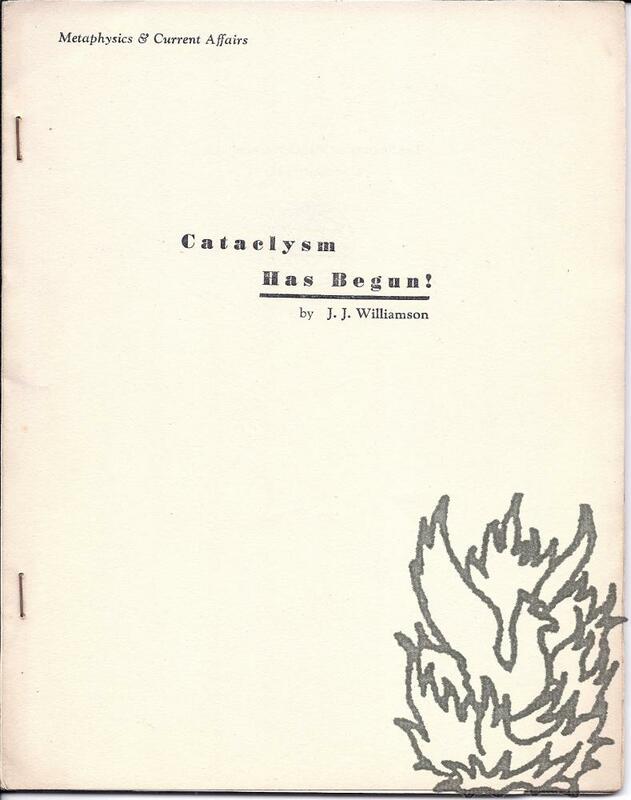 [ J. C. Williamson Ltd., Australian theatre management firm. ] Collection of 15 numbers of 'J. 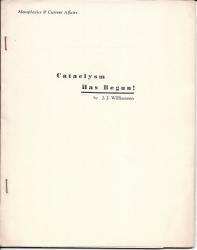 C. Williamson Ltd. Magazine Programme' and two numbers of 'Theatre Royal Magazine Programme'. [ Printed by Whitmarks Ltd, Sydney, Australia, for the publishers City Ads. Ltd. ] The 17 numbers dating from between 1928 and 1941. The collection is in fair condition, with rusted staples, and slight age and wear to the covers of most of the numbers, with a handful in not such good condition, the covers of one of them being almost detached. All 4to, and ranging in length between 20pp. and 64pp. Well-illustrated, with coloured covers, biographies, news and gossip, relating to actors, plays, the chain and its theatres, as well as wider topics such as 'Russian Ballet in London', 'A Few Toilet Hints. By Phyllis Monkman', 'The Grenadier Guards Band. Shortly to Tour Australia', and 'Modern Make-Up'. By Miss May Murray. [George Charles Williamson, art editor to George Bell & Sons.] 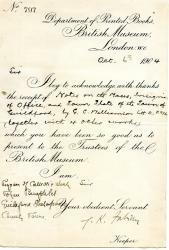 Autograph Letter Signed ('Geo C Williamson') to H. C. Marillier, reporting the high opinion of the Pre-Raphaelite patron George Rae of Birkenhead of his book 'Dante Gabriel Rossetti'. On letterhead of G. Bell & Sons, York Street, Covent Garden, London. 24 August 1900. 2pp., 12mo. Bifolium. In good condition, on lightly-aged paper. For further information about Williamson and his publications, see his entry in 'Who Was Who'; see also Marillier's entry in the Oxford Dictionary of National Biography. [John Churchill, London medical bookseller and publisher.] Itemised invoice, signed 'settled | J. Churchill', for books bought by Rutherford Alcock on behalf of W. Williamson; with Autograph Receipt Signed ('John Churchill'). Invoice: on his letterhead as 'Medical Bookseller and Publisher, Princes Street, Soho'. 24 April 1841. Receipt: London. 24 April 1841. ONE: Invoice headed 'To Account delivered 1839.40'. 1p., 4to. In good condition, on lightly aged paper. Addressed to 'Rutherford Alcock Esqre. | (for W Williamson)' and listing four titles including 'Wilsons Anatomy' (12s 6d) and 'Alison's Physiology' (12s), totalling £10 15s 0d. Beneath the four entries the bookseller has writen 'Settled | J. Churchill | 24th. April 1841', and beneath this Williamson has added 'The above is quite correct | J Williamson | 9July 4th 1842'. TWO: Receipt on one side of 8 x 18.5 cm slip of paper, with embossed 6d stamp. Reads: 'London 24th April 1841. [Jane Dalgliesh.] Manuscript itemised laundry bill, made out by her for David Williamson [later Lord Balgray]. Place not stated [Scotland]. Entries dating from 7 April to 9 August 1780. [The Court of the Lord Lyon.] Itemised manuscript 'Note of Fees of Armorial Bearings for Miss William Boyd Robertson of Lawers.' With manuscript receipt for payment of this bill, signed by James Horne, Lyon Clerk. The 'Note of Fees' dated November 1814. Horne's receipt from Edinburgh, 18 November 1814. [Dollar Mains, Clackmannanshire, Scotland.] 9 December 1796. 1p., foolscap 8vo. Very good, on lightly-aged paper. Docketted with title and date on reverse. The list is headed: 'Decr. 9th 1796 Inventory of farming utensels [sic] at Dollar mains belonging to Mr Williamson'. Listing, in two columns, 46 items from '2 Carls | 1 Pair of Cart wheels' to 'about 1000 Stones of hay' and 'about 8 Balls of oats unthreshed'. At foot of page: 'NB A number of the above articles purchased since Capn.Williamson came to Dollar'. [James Williamson, Professor of Mathematics at the University of Glasgow.] Autograph Letter Signed ('Jas. Williamson') to his brother Alexander Williamson, Laird of Balgray, discussing financial matters and his son George's choice of career. 'College Glasgow'. 1 June 1792. 2pp., foolscap 8vo. Bifolium. In fair condition, on aged and worn paper. The breaking of the seal has resulted in slight loss at the foot of the gutter, affecting two words of text. Verso of second leaf addressed, with two postmarks and red wax seal, to 'Alexander Williamson Esqr | Alisons Square | Edinburgh'. [Queen Victoria's FIRST visit to Scotland, 1842.] Three MS.receipts, two of them regarding 'erecting triumphall Arches', the other a 'Note of Men Employed in the Village of Comrie [...] to join the Lawers Company for hir [sic] Majesty the Queen'. [Lawers, Strathearn, Scotland.] All three paid on 26 December 1842. The three documents in good condition, on lightly-aged paper. ONE: 'Note of Men employed in the Village of Comrie by Orders of Mrs. R. Williamson of Lavers - to join the Lavers Company for hir [sic] Majesty the Queen'. [on reverse] 'Lawers | Thos Biccarton for Men attending during the Queens Visit | £1 .. 19/- | paid 26 Decr. 1842'. Beneath this in pencil in a later hand: 'Queen Victoria visit to Strathearn | Sept 10 1842'. 1p., 4to. With some words in red ink. Mainly comprising a table of 29 names, days, wages due, of men 'Attending the Lawers Company'. 'At Closeburn Castle'. 18 September 1769. 1p., large quarto. In fair condition, on aged and worn paper. With two embossed stamps ('VI PENCE' and 'I SHILLING ADDITIONAL DUTY') and ink stamp ('Nine Pence Quire') on reverse. Folded into the customary packet and docketted: 'Bond £225 | Messrs. James & George Kirkpatricks, James and Alexr. Williamsons | To Mr. William Ewart | 1769'. The document begins: 'We Mr. James Kirkpatrick Advocate George Kirkpatrick one of hte deputy Clerks of Session, Doctor James Williamson Professor of Mathematicks in the University of Glasgow and Alexr. Williamson Secretary to the Rt. Honble. [Alexander Williamson, Laird of Balgray.] Fourteen Autograph Letters Signed to him from his French daughter-in-law, mainly regarding the renovation of her house, Dollar Mains, Clackmannanshire; four written jointly with his grand-daughter Ann. Six of the fourteen from Dollar Mains, Clackmannanshire, Scotland; one from 'Mrs. Fisher's Drummond Street', Edinburgh. Dating from 1799 (3), 1802 (5), 1803 (5), 1804. Totalling: 32pp., 4to; 3pp., foolscap 8vo; 3pp., 12mo. Each letter a bifolium, addressed on the reverse of the second leaf, with various postmarks, wafers and seals, and each docketted by the Williamson. The collection in good condition, on lightly-aged paper. The fourteen letters addressed by 'E. Williamson' to 'Alexr. [Alexander Williamson, Laird of Balgray.] Autograph Signed 'Copy Discharge Alexr. Williamson to Edwd. Mitchell for Rent of a House in Alison's Sqe. possessed by him from Why 1800 to Why 1801'. [Royal Military College, Lanvers, Perthshire.] Printed circular letter from the Royal Military College, Sandhurst, regarding cadets 'incurring Debts with Tradesmen'. Addressed in manuscript to H. G. Watson, concerning his ward D. R. Williamson. Royal Military College [Sandhurst]. 9 June 1845. 1p., 4to. On bifolium. Addressed on reverse of second leaf to 'H. G. Watson Esqr. | 13 St. Andrew's Square | Edinburgh', with three postmarks, and docketted 'Lawers | Military College 9 June 1845. | Tradesmens Bills'. In good condition, on aged and worn paper, with a few closed tears. The signature is illegible, but does not appear to be that of the Governor, General Sir George Scovell. [John Williamson of Tynron Cottage, Thornhill, Scotland.] Autograph Letter Signed to Edinburgh lawyer David Williamson, regarding his immediate voyage to St Kitts in the West Indies, ship called the "Nevis Planter', with six gallons of Scotch whisky. Tynron Cottage [Thornhill, Dumfries and Galloway, Scotland]. 4 January 1801. 1p., foolscap 8vo. In fair condition, on lightly-aged paper. Addressed on reverse of second leaf, with red ink postmark and broken black wax seal, to 'David Williamson Esqr | Advocate | George's Square | Edinh'. There is no indication in the letter that the two men are kinsmen. 'My Dear Sir, | I am happy to inform you that the ship called the Nevis Planter sails from Liverpool for St. Kitts on the 12th. Inst - with your approbation, I propose sailing with her - | Mr.
4to, vii + 21 pp. Stapled pamphlet, on two different paper stocks (white and grey), front cover detached Text clear and complete. Good, on aged paper, with crease to one corner of title-leaf. Title leaf printed, the rest mimeographed. Pp. v-vii consist of an appendix at the rear of the volume. Occult pseudo-science (the Society's logo is a pentacle), presaging the hippie 'retreat from reason' in the face of Cold War realities. Begins 'For ten years the Society of Metaphysicians has worked in the interests of human unity at all levels. Typed Letter Signed to Noon. 6 September 1924; on his Queen Anne Street letterhead. 4to, 1 p. Nine lines of text. Good, on lightly-aged and creased paper, with punch hole to top left-hand corner. Explaining why it is impossible for him to accept the invitation of the Norwich Medico-Chirurgical Society. Printed Receipt, completed in manuscript and signed, for five works by Williamson legally deposited in the Library of the British Museum. 6 October 1904; Department of Printed Books, British Museum, London. On one side of piece of paper 23.5 x 16 cm. With perforated edge. Good, on aged paper, with traces with strip of glue from previous mount on reverse. Printed in copperplate. The deposited works are 'Notes on the Maces, Insignia of Office, and Town Plate of the Town of Guildford', 'Progress of Catholic Work', 'Token Pamphlet', 'Guildford Shakespeare' and 'County Town'. Ostensibly signed by the 'Keeper', but the signature is not decipherable (''). In his obituary in The Times, 6 July 1942, Williamson was praised as 'a highly industrious and versatile writer on art'. 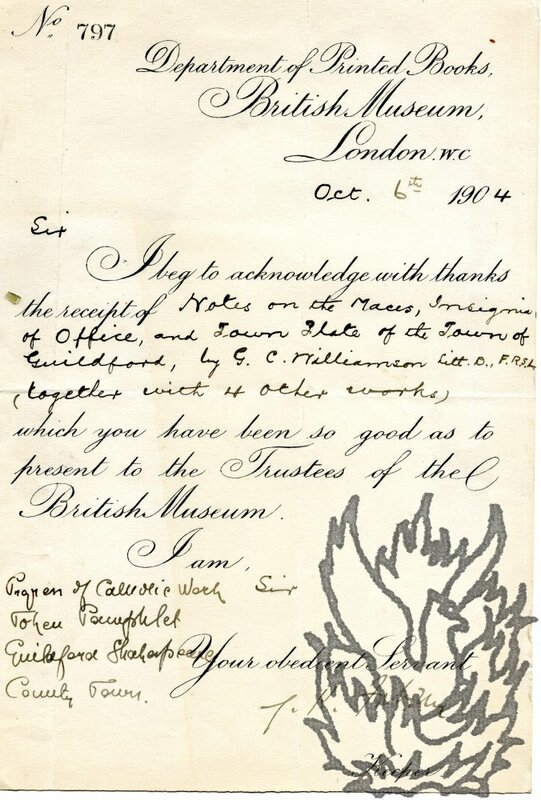 Engraved copperplate Certificate, completed in manuscript and signed by E. Gilbert Highton, with a long 'Private note' by him, notifying Williamson of his election to Fellowship in the Royal Society of Literature. 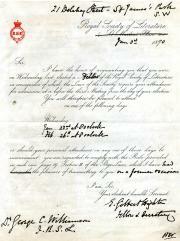 3 January 1890, on letterhead of the Royal Society of Literature. 4to bifolium (leaf dimensions 26 x 20.5 cm). The notification certificate is on the recto of the first leaf, and Highton's letter is on the recto of the second. Versos of both leaves blank. Good, on lightly aged and creased paper, with 5 cm closed tear to margin of second leaf caused by removal of letter from stub, traces of which still adhere to the verso of the second leaf. The certificate is tastefully printed in black, with the Society's crest in red in the top left-hand corner.